ANDREW CRAIG RECEIVES FEEFO GOLD TRUSTED SERVICE AWARD 2019 We are looking for a Land and New Homes Sales Negotiator We are looking for a Sales Negotiator for our Contact Centre Local Agent Selected to Join National Land and New Homes Network We are looking for a Mortgage Administrator South Tyneside Council's call for Sites Low Fell Scooter Club Easter Egg Ride Out You'll LOVE £10,000 Cashback! We are looking for a Sales Negotiator for our Gosforth Branch House For Sale with a Guide Price of £1 sells for... Help to Sell at The Courtyard We are proud to support Cash For Kids Prison for landlords who fail to comply with Right to Rent Landlord Tax Clinic with Martin Wardle Chartered Tax Accountant Andrew Craig has Confidence in Property Market post Brexit vote Want to know what your Home is worth in under 60 seconds? The re-introduction of the 100 per cent Mortgage We are looking for a Sales Advisor / Customer Service Representative Andrew Craig Careers - We are looking for a Sales Valuer for our Low Fell Branch New Gosforth Branch Now Open! New Year, New Home Event Landlords - Urgent Action Required How can you encourage people to buy your home? Why Christmas is the Best Time to Market Your Property New rules regarding smoke and carbon monoxide alarms Our New Site Is Launched! Wash the windows. With shorter days, it’s important to make the most of the light flooding in. Brush away dust and cobwebs before using a sponge with a solution of vinegar and water for best results – and wipe dry with a clean, dry cloth. Dust and polish. Get rid of the summer build-up of dust and pollen by using a quality furniture polish and cloth. Rearrange the furniture, dust down book shelves and make sure your mirrors and silver are gleaming. Put away your summer clothes and linens. Replace them with cool-season items like your woollies and coats. To keep moths at bay, use moth balls or lavender moth repelling scents in the wardrobe to reduce the chances of them going near clothes. Cobwebs. It’s spider season and the inside of your house might start to look like you’re decorating for Halloween early! Getting rid of spider’s webs isn’t too tricky. Ensure you remove them with an extendable long-armed duster or use an appropriate vacuum attachment and be careful when attacking corners of ceilings where you’ll often find them. De-clutter your kitchen cupboard. Throw away any foods that are out of date, and spices that are more than six months old or have lost their scent. Clear out the fridge, defrost the freezer and throw out all your old food. Defrost The Freezer. Your freezer is one of few appliances which is used on a daily basis, and to keep it working to its full potential it is important to make sure you keep on top of freezer maintenance. Key to such maintenance is to defrost your freezer – if you don’t have a self-defrosting model. Clean & Test Chimneys / Smoke / Carbon Monoxide Alarms. Wood burners and real fires have seen somewhat of a boom in popularity over the last few years, and with the temperatures starting to fall, they will soon be put to use – providing warmth and comfort on those dark, wet nights. Tied in with cleaning the chimney, you should also test your smoke alarms and carbon monoxide alarms, making sure they are in full working order. Clean Behind & On Top of Furniture. When running the vacuum around the home on a weekly basis, very few of us will move the couch, wardrobe or sideboard out of the way to clean behind. A top house cleaning tip when carrying out a big clean, is to clean on top, behind and underneath your furniture. Clean Bedding, Upholstery & Curtains. Whilst changing your bedding on a weekly basis will help to keep the bed clean, you may be surprised at home much dirt can be harboured on your mattress. Along with dirt, bedbugs are becoming more common in UK households – so it is important to clean the mattress on a regular basis to kill these off. We recommend using a steam cleaner to clean your mattress, upholstered furniture and curtains. Steam cleaning kills 99% of germs and bacteria, at the same time as removing dirt without the need for chemicals, and the heat produced by a steam cleaner will kill off any bedbugs and eggs which may be lingering on your mattress. 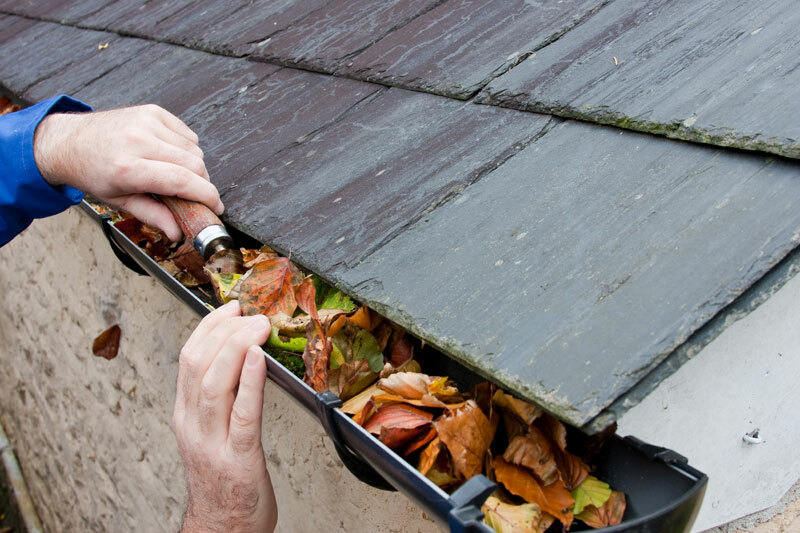 Inspect and clean gutters. Regularly clean gutters and downspouts. Make sure all drainage areas are unblocked by leaves and debris. Consider installing gutter guards to make the job a lot easier.